Create a permanent study space. Differentiating between spaces in your home that are for relaxing versus doing work is crucial. Make a work station stocked with pens, sticky notes, chargers, snacks or anything else you need to help increase your productivity. Try to consistently use this space for school work and school work alone. This allows to you always associate this space with work and can also minimize distraction. Tip: If possible, try not to make this space in your bedroom. You are more likely to gravitate towards your bed if you can see it calling your name! Ask everyone to keep the volume down. This one may seem like a no-brainer, but give it a try. Make your children, roommates, or anyone else around aware that you need a bit of quiet time to finish your work before you can join them. With a quieter environment you are more likely to power through your work so everyone can resume their fun. You may a feel a little guilty about imposing a volume restriction, but it’s only temporary and it never hurts to ask, right? Tip: If you live in a noisy area download one of these sound machine apps or crank up the volume on some relaxing tunes. Eliminate all distractions. Turn your phone on airplane mode, move everything off your desk that isn’t related to your work, and for those who get really easily distracted, check out the Self Control App and block distracting websites on your computer. Keep track of time. Keep a clock or watch on hand and set a goal for yourself. If you know you want to be done within an hour, you’re more likely to stick to this goal if you hold yourself accountable and stay aware of the time. Find your hour of productivity. Do you work best if you’ve had some time to eat and relax? Or maybe you’re most productive if you dive right in when you get home from work. Find your most productive time and make it a habit to always conquer your work when you’re feeling most motivated. Tip: If you want to power through but know you’ll be distracted by your growling stomach, prepare a quick healthy snack to hold you over. Any personal tips to share? Tweet your favorites to @BrandeisGPS! Brandeis University’s Graduate Professional Studies division (GPS) is dedicated to developing innovative programs for working professionals. GPS offers 11 fully online, part-time master’s degrees and one online graduate certificate. 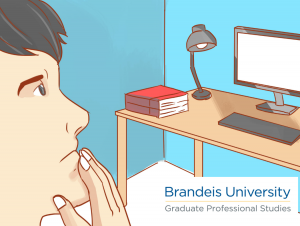 With four 10-week session each year, Brandeis GPS provides exceptional programs with a convenient and flexible online approach. Courses are small by design and led by industry experts who deliver individualized support and professional insights. For more information on our programs visit the Brandeis GPS website.